I love holidays. Even the silly little ones. My kids are at an age where they are easily excited and love any excuse to make a normal day seem a little bit special. 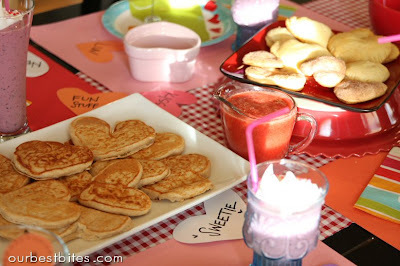 So I decided to surprise them this morning with a fun Valentine’s breakfast. Share the love people! Something like this really doesn’t take much. I remember when I was a kid, my mom would put pink food coloring in my cereal milk and I thought it was the coolest thing ever. As long as you have a heart shaped cookie cutter and something pink, you can pretty much turn anything into a Valentines something! I threw this together at the last minute so you’ll see how easy it is. 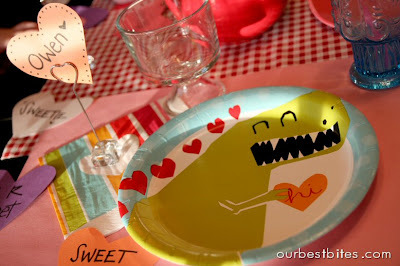 As a mom to all boys, I love when I find fun V-day stuff that’s not entirely pink and covered in sparkles. Like these T-rex plates, perfect! On sale at Target right now. 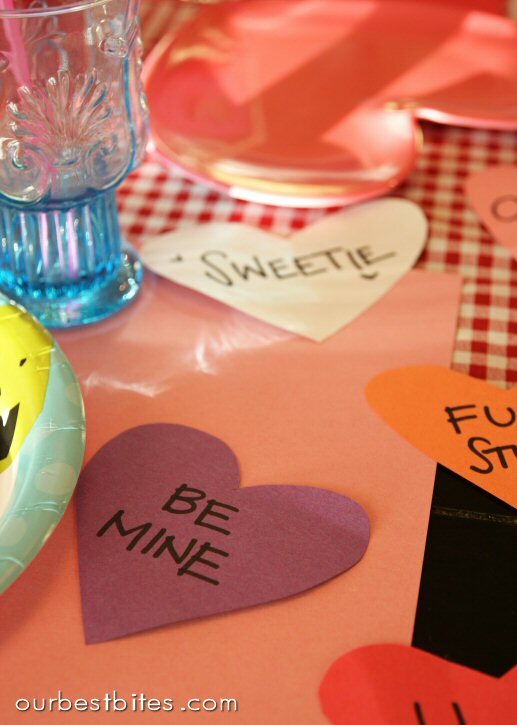 10 minutes making conversation hearts from construction paper took care of some simple decorations. Plus it ended up being great reading practice for my pre-schooler! Ya, I totally educate. 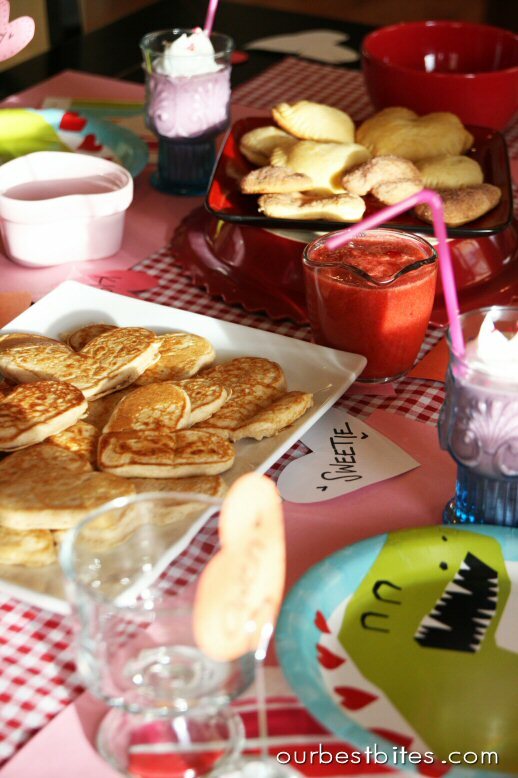 We ate heart shaped pancakes (from a mix people- we’re talking easy!) 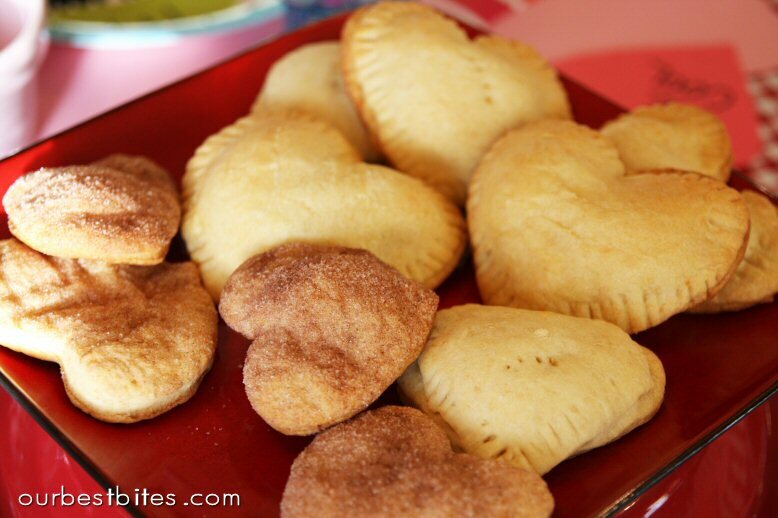 Just spoon them onto the pan in heart shapes. And I made strawberry syrup. It looks like this amazing fresh syrup but alas, it is not. It took me about 45 seconds to make. It’s just a few frozen berries mixed with a spoonful of strawberry jam and Nestle strawberry syrup. Blended then heated. It was awesome. 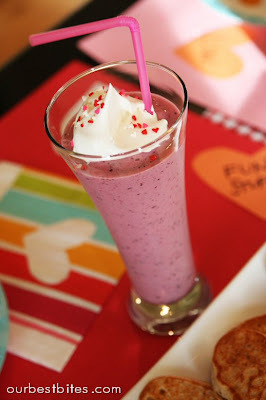 We drank Berry Smoothies with cool whip and sprinkles. Generally when you mix strawberry ice cream with milk, berries, and sugary syrup you call it a milkshake. Except if you consume it before 10am. Then you can call it a smoothie and feel good about eating fruit for breakfast. That’s what I did. 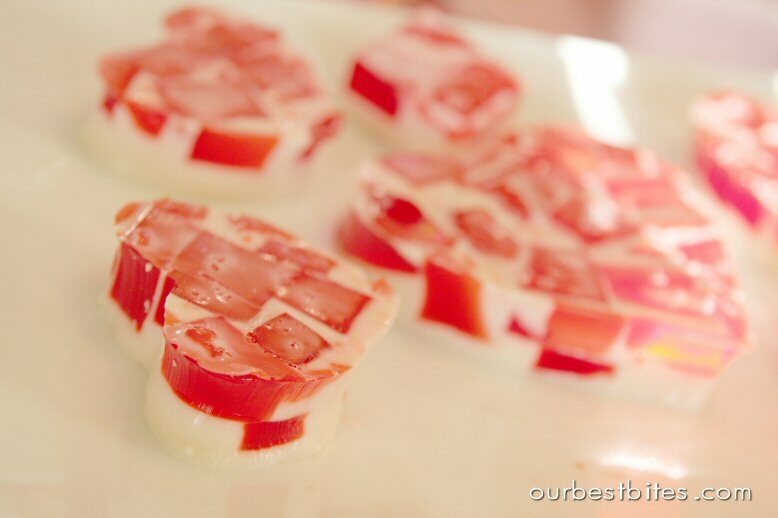 Heart shaped Glass Block Jello with raspberry and strawberry jello. This is just a roll of refrigerated crescent dough. I cut out heart shapes and put scrambled eggs and cheese inside. We sprinkled the scraps with cinnamon and sugar. Yum! All in all a success. Easy, quick food and fun family time together. There’s even a hot guy in the kitchen doing my dishes while I type. Dang I love that man! My hubby went out and got donuts for everyone this morning. That counts as our fun breakfast. I love the egg heart things! What a sweet breakfast! Love it! How sweet!! I love those plates, they're perfect! 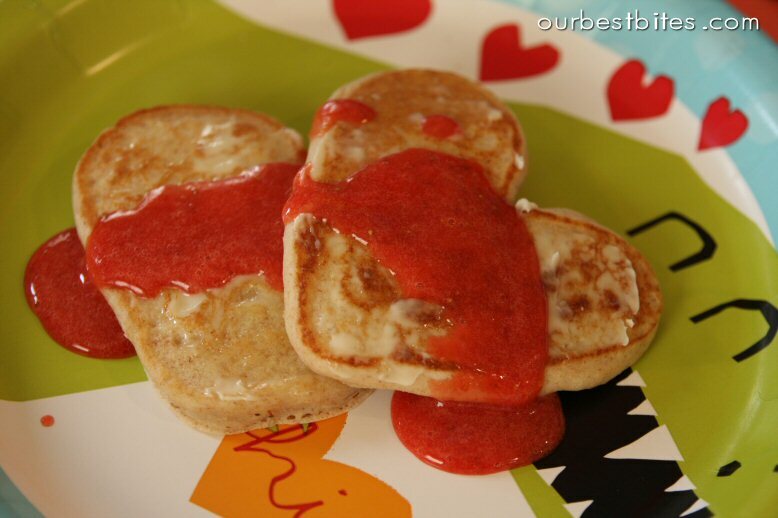 What cute valentine heart pancakes too. What a fun holiday!! We are having a Valentines day all day today! For breakfast, I fixed pink pancakes with white chocolate chips and strawberry sauce with whip cream. For lunch, I made purple fettucine alfredo. For dinner, I shaped little meatloafs into heart shapes, I am making pink mashed potatoes and beets!! I also made red rice krispie treats for snacks!! Fun Fun Day!! 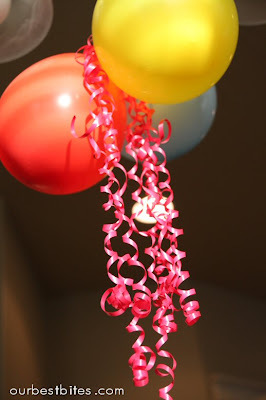 Really sweet ideas! Valentine's Day can be such a fun day especially with little ones! Love this! Great ideas that are simple and affordable. Thank you! BTW…am I the only one waiting until Valentines Day to celebrate and do something special? What a fun breakfeast to make your kids feal special! how sweet…and your kids will remember it. One day years from now when they are older they will tell the story…..way to go on making a fantastic and fun memory!! What a sweet idea! You are such a fun mom! What an adorable breakfast. Love it! What a wonderful idea!! I think I'll make this meal for supper on Valentine's Day. I can prep it while they're at school and they adore breakfast for supper! Thanks! So sweet! Love the smoothies!!! present on a holiday?! Please let it be your cook book and let the winner be ME!!! Question: do you fully scramble the eggs then pop them in the crescent rolls? ^^It's a marshmallow creme recipe that its awesome and I know it doesn't relate to breakfast, but maybe you could make fluffer-nutters and cut them into hearts. Anyways I think this is awesome, tastes just like the jett puff kind and I didn't have to go to the store to buy it! Plus it's a forgiving recipe, I know cuz I messed it up, lol but it came out great! Try it in cupcakes with pink frosting for Valentine's Day! It's awesome and I had to share with you all! randumbredhead- since they'll get baked in the oven, you can undercook them in the pan. I cook them so they hold their shape, but they still look wet. Does that make sense? And thanks for the recipe- it sounds yummy! I'll have to check it out. So glad I found your blog! Thanks for all the great recipes! Very cute! I am going to be ambitious and do heart shaped cinnamon rolls 🙂 Happy Valentines day to you! This is too cute! I love it! I just got your new cook book for my birthday I am so excited! Thanks so much! Those look great! I love the heart shape pancake idea. I love your sense of HUMOR! and thanks to your blog my family will be getting a sweet breakfast surprise in the morning. I usually do something every year but your blog was the motivation I needed. Love your recipes too! THANKS! Awesome!!! Lucky kids to have such an awesome mom! Wish I had read this yesterday. Well we could have breakfast for dinner, or maybe just some yummy heart shaped cookies are in order. Thanks for the sweet ideas. I started our Valentine's day dinner early this morning and found my chocolate kisses next to my slow cooker!!!!! I loved the creativity in the X-O-X-O's!!! Happy Valentine's Day and good luck winning one of the 3 books! I got my Valentine surprise early this morning while I was preparing our Vday dinner! It was X-O-X-O's in chocolate! I love his creativity! 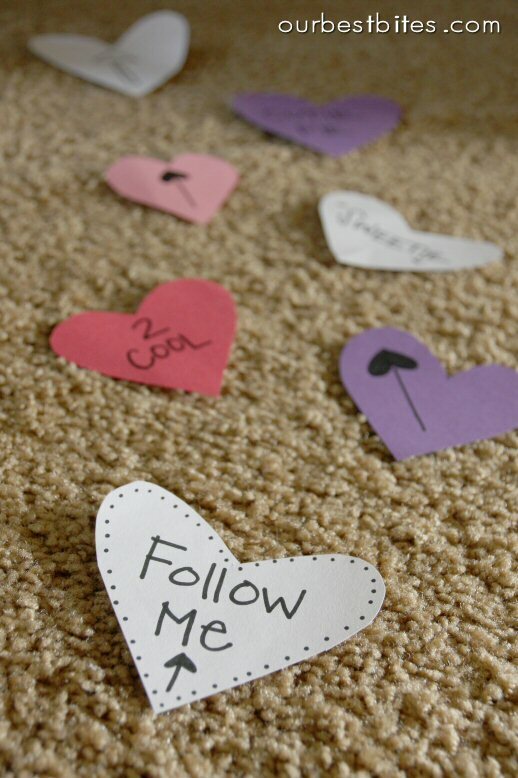 Happy Valentine's day & good luck to the 3 lucky winners who will win a book! I made heart shaped pancakes yesterday for my family for the holiday! Tonight we will have waffles with fresh strawberries and cream…all by candlelight with the kids! Thanks for the new ideas, girls! So cute and yummy!! I'm pretty sure I NEED your recipe book! Here's hoping!!!! I would love to win one of your cookbooks. Thank you for all of your wonderful Valentine ideas. Thanks for the ideas. Will try the icing – something I've been wanting to try for a while. I made my kids your crepes recipe for Valentine's breakfast, only with butter, sugar (well, splenda-blend) and lemon juice because I grew up in England and that's how they make them there – yummy! One kid liked them that way, and the other liked them better with maple syrup (I'm gonna try your buttermilk syrup next). Thanks for the recipe, I usually make plain old American pancakes so it was nice to find this recipe. Although I was running late for work (hubby forgot to set the clock) I still found time to make him the heart shaped cresent rolls with scrambled eggs and cheese. He said they were great. Thanks for the wonderful idea. 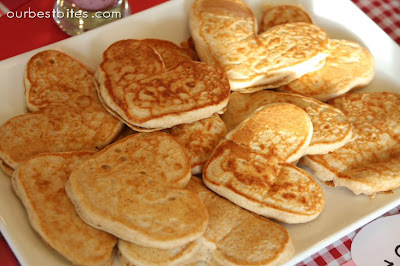 My daughter said "oh, how cute butterflies for breakfast" Apparently I need some work on making pancakes into hearts! Thanks for the inspirations. Your daily blogs make my day and hep me plan my week. LOVE it!! Keep them coming. Made the "Sweetie Pie" suckers and they were a hit. Already a fan on facebook and I really would love the cookbook. Thanks for all you do. I love your site – so much fun! We're so excited for your book to come out! My cookbook came today!! On Valentines day!! I was so happy to see the mail carrier I could have kissed him!!! Thanks so much! I just sat down and looked at it cover to cover!! I am so excited about all of the new recipes!! And it is nice to have some of my favorites in print!! We always have a special Valentine's breakfast too- biscuits and chocolate gravy. It's a family favorite from my husbands side of the family. For Valentines I make heart shaped biscuits. My kids love it, esp as its a special treat we only make once or twice a year. We had heart shaped pancakes for breakfast on Sunday morning and we also had the chocolate chip pie for desert on Sunday night…ummmmm YUMMY!!! I LOVE your site and share pics of what I make on fb…ppl ALWAYS want the recipes and I, of course, send them to become a fan!! YOU ROCK!! Saw you on Studio 5 and you both are so cute and slender! How do you do it with all the amazing food you make? I would love to have a copy of your new book so I too could look slender and young like you two. I love all the recipes I have tried. I would love to win a cookbook! Love your blog and WANT to win your cookbook! YAY! My family just loves all the recipes that we have tried and ideas that you have provided me with. I would love to have your new cookbook as part of my collection. You have such great ideas for making everything such fun! Would love to win your new cook book! First time visiting your site and it won't be the last! Would love to win your new cookbook. First time visiting your site and I'm hooked! oohh, I'd love a cookbook! Thank you for all the tasty rcipes and super original ideas and then you have the talent to come out with a COOKBOOK. Please count me in..hope I can win before I buy. Love all of the different ideas for the holidays … so many fun things to try out! I think you gals hung the moon!! I joined FB just to try and win a copy of your book! Ive tried a few of your recipes always a delite! The strawberry sauce is delish! I just thought I would share this after reading about your pink milk. Last year for halloween, I decided my sons class needed orange milk to drink for snack, so to practice I made the small amount of milk I had in my fridge orange, it worked great. Then I remembered I was making masked potatoes for dinner, yep they came out orange, cute right? Except when your 3 year old only eats like 4 foods, one of them being mashed potatoes. She wouldn’t touch them! Cried about them even,it was so funny! So alas I dont think I’ll be dying milk (or potatoes) anytime soon! Pingback: Our Valentine’s Day Traditions….